About 2,000 debt-stricken farmers in India's cotton growing Vidarbha region resorted to a protest with flowers to persuade a bank to disperse loans. They garlanded the bank manager while a woman in the group washed his feet. The protest was inspired by a Bollywood blockbuster film that has revived and popularised Mahatma Gandhi's message of peaceful protests. Activists say debts have led more than 950 farmers to commit suicide this year in Vidarbha in Maharashtra state. Many women were among the protestors in a village in Yavatmal district, which has been worst hit by farmers' suicides. The manager of the government-run State Bank of India told the farmers that although he agreed and sympathised with them, he could not sanction their loans but would forward their request to the finance ministry. 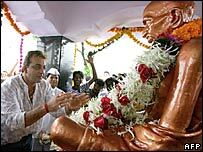 The Bollywood film Lage Raho Munna Bhai's (Keep at it Munna Brother) attempt to simplify Gandhi's message of peaceful protests, or Gandhigiri as it is called in the film, has gone down well in the country. Vidarbha's farmers had been protesting, some times violently, against what they see as government apathy. So Thursday's protest, modelled on Gandhi's non-violent way of protest, represented a chance of tactics. Activist Kishor Tiwari told the BBC the protest was an attempt to persuade the manager to disperse more loans as loans have so far covered only 50% farmers in the district. Mr Tiwari said the bank had to stop dispersing loans after it ran out of money. More than 200 farmers from Yavatmal alone have killed themselves since the Indian Prime Minister, Manmohan Singh, announced a relief package of $815m on 1 July. Campaigners say on average five farmers are committing suicide everyday in the district, which is one of the poorest in the cotton growing Vidarbha region. 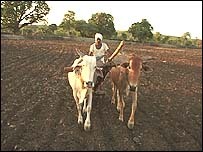 Many farmers say help has yet to reach them. Vidarbha is home to 3.2m farmers, more than 90% of whom are heavily in debt.